I remember whenever I would try out a new recipe on my own or with my friends or kaki, we would follow the recipe word to word. But that was when we were learning. Now its getting the main ingredients and the method correct and then the recipe turns into my way, my method etc. Now, I have the confidence to explore and find easier ways. Don’t get me wrong, certain recipes do have to be followed precisely. Can you imagine not adding baking powder or soda to the cake, over fermenting the bread dough, adding more liquid to the roti or paratha dough, adding more salt to the curry, etc etc. There are so many possibilities for a recipe to turn disastrous. I have had my share of failures and some have been beyond repair. During my Polytechnic days, my friends and I would dine at each others place quite often. The fun part was that we would also prepare the dinner for us and the rest of the family. At that time, Tarla Dalal’s books were our Bible. We would decide on the recipe, shop and cook. 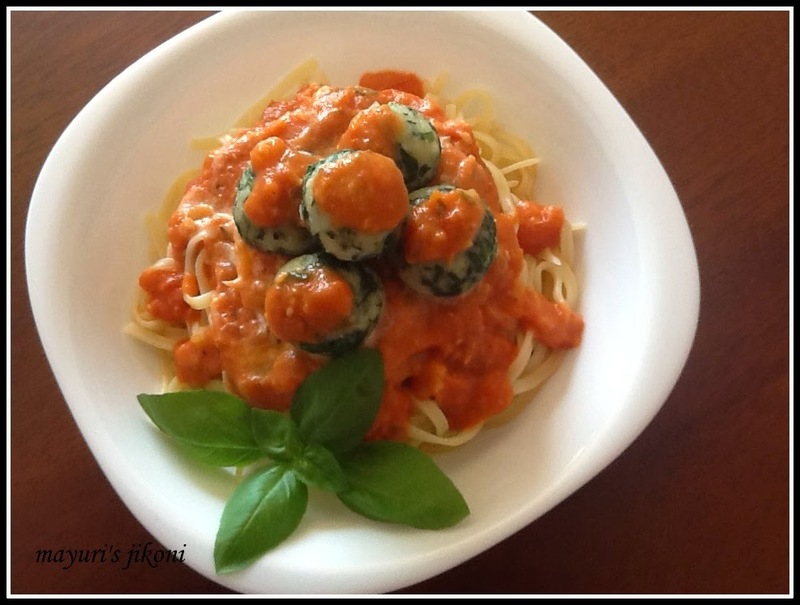 One of the recipes we would make was her baked spaghetti with paneer balls in spinach sauce. So when Lakshmi Vimala suggested spinach and cream as my 2 secret ingredients for the shhh cooking secretly challenge, I wanted to make baked spaghetti with paneer balls in spinach sauce. However, as I planned out the recipe it took a whole new conversion as I didn’t want to fry the balls. Also didn’t want to make the spinach sauce as I didn’t have enough spinach, but spinach I had to use. So from the basic recipe, I turned mine into different dish. Of course hubby dear would have loved it if I had fried the balls. Place the washed spinach in the tray of the steamer and let it steam for 2-3 minutes or until it becomes a little soft. Remove the spinach from the steamer and let it cool a bit. In the meantime add the rest of the paneer ball ingredients to the paneer. Squeeze out the water from the steamed spinach and add it to the paneer. Mix and make it into a dough. Grease your hands with little oil and make balls. I took about a tablespoonful of the mixture and got about 16 -18 balls. Boil water in the steamer. Grease the steamer tray and place all the balls in the tray. Steam the paneer balls for 10 minutes. Remove the balls from the steamer and keep it on the side till required. Add the chopped onion and stir fry till it is soft and cooked. Add garlic and stir fry for a few seconds. Add the tomato puree and salt. Cover the pan and cook till the sauce becomes thick. Add pepper and let the sauce cool down a bit. Add the fresh cream and mix well. If you need to heat up the sauce again, then use low heat and stir the sauce frequently. Boil water in a deep saucepan. Add the pasta and boil for 8-10 minutes or as instructed on the package. Stir occasionally while its cooking. Drain out the pasta into a colander. Sprinkle a bit of olive oil over the pasta and mix. Spoon the pasta into the serving plates. Top it with the sauce. Sprinkle cheese over it and serve. Fry the paneer balls if you like. Can add the paneer balls to the sauce if you like, once the sauce is ready. Use white or spinach sauce if you like. Use spaghetti instead of tagliatelline. Always boil pasta with plenty of water to avoid it from sticking to each other. spinach balls look to good…hey dear i can't comment on some of your recent post… why?